The moment you have a plumbing problem, it is essential to contact your local plumber so that you do not go through too much problem and stress. Should you find that you are unsure of any leaks, clogs or other plumbing disorders, never hesitate to get in touch with your plumber. When any plumbing problem occurs, calling a can save you any damage that might occur to your home. Not many people think that the plumbing can create major problems that can bring about serious setbacks. But if you have a home that is about 10 years old or more, the demand on plumbing can be strenuous and problems might begin to emerge. If for example you have a leaky tap, this might cost you hundreds of pounds every year. Other small plumbing problems can easily turn into major issues that might prove to be very costly in terms of repairs. Plumbing problems can bring devastation to your belongings and your home particularly water damage. This is why the moment any plumbing problem develops, it would be best to look for a professional plumber who will determine what the problem might be. Instead of allowing plumbing emergencies to catch you by surprise, it would be best to call a plumber before an emergency occurs. If repairs are not undertaken promptly, worse problems might take place. This will mean more money spend on repairs and replacements. It will also mean a lot of inconvenience and because water might damage other things. 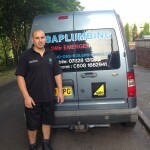 Having a plumber that you can call at anytime of the day or night is very essential. There are some less complicated issues related to plumbing that might become major issues if not taken care of. By taking care of the small stuff, you actually save yourself time, money and avoid the misery of a house that is clogged with water or has leakage all over.